"Some of you will know that Ramsey Million Big Local sits within the rural Fens of Cambridgeshire but for those of you who don't, our Big Local area is made up of a small town and five surrounding villages. We are around fifteen miles away from the nearest large town. Bus operators are threatening to close routes because they claim they are uneconomical – which is often the case with rural routes! People relying on the bus to get to the nearest large town will struggle to get there. Those without a car can't enjoy leisure activities, like going to the cinema. The bus routes are along rural roads with no pavement or cycle-ways, just miles of country road alongside dykes, drains and agricultural fields. 15.4 percent of households in our area do not own a car or van. People have walked over 20 miles to sign on at the nearest job centre - along very poor routes that are extremely unsafe and not equipped for pedestrians. "We’re trying really hard to make an impact and to reduce the rural isolation that people tell us they feel." We have looked at other rural communities for ideas. Kickstart moped hire was working well in Norfolk so our focus moved to that. Residents can rent a moped for £5.00 a day to get them to and from job interviews. On average people use the mopeds for around five months, during which time they often save enough to purchase their own means of transport. The pilot funded by Big Local here in Ramsey has been a success and Kickstart Norfolk decided to expand their operations beyond Ramsey Parish and into other areas of rural Cambridgeshire. What an amazing impact for Big Local – not only supporting people in the Big Local area but having a wider impact across the county. We’ve also looked at other transport options. Ramsey has a community bus, a charity that has been operated by volunteers for around 30 years. Their primary function is taking older people to the day centre within Ramsey town twice a week. The scheme works well - but there are always going to be limitations when we have to rely on volunteer availability and existing subsidies to keep the service running. The Ramsey Million Partnership has set money aside within their plan to support community transport as and when necessary. The team have issued some grants over the past couple of years to ensure there are no service disruptions. But like everything else garaging costs have gone up, as have the repair bills as the buses get older. "...regulations would force an end to their activities, leaving thousands of people without regular services." We’ve talked at length about sustaining the community bus service and whether there should be a paid driver to maximise the usage of the vehicle but haven't come to a decision as yet. If we do, there's a chance the service could be impacted by changes to regulation from the Department of Transport. Part of the consultation we were invited to take part in covers tightening regulation on drivers trying to obtain a Public Service Vehicle (PSV) Licence. The main issue is around community transport competing with regulated operators, and whether the community transport schemes are operating commercially, with some even competing for tendered services. We were told that exemptions and permits may still be granted. 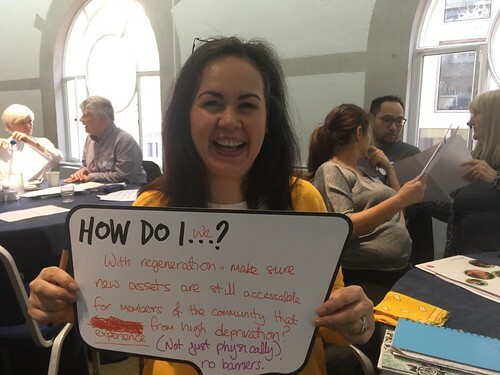 I can tell you the discussion in the room on the day I attended was passionate, with many community transport schemes feeling these regulations would force an end to their activities, leaving thousands of people without regular services. This is going to be an area to watch over the coming months. More about these changes can be found here. The Ramsey Million Partnership has supported the community petition to save the bus routes, with well over a thousand people signing. We’re also trying hard to deliver more opportunities right here within the Big Local area, reducing the need for people to travel out. We now have a holiday Playscheme, soft play sessions for under fives, regular activities for young people and our own trips out on the community bus. We’re trying really hard to make an impact and to reduce the rural isolation that people tell us they feel." I hope some of this helps other Big Local areas looking at similar topics. For more information on Ramsey Million visit our website or find us on Facebook.